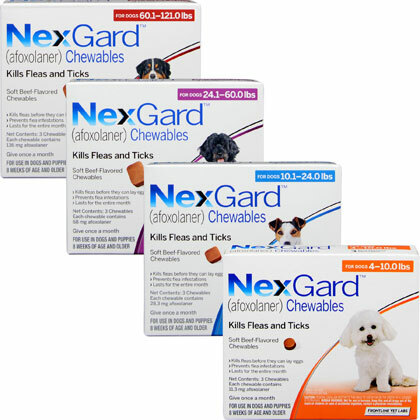 NexGard (afoxolaner) is FDA approved for veterinarian use, and demonstrated 100% effectiveness against adult fleas 24 hours post-infestation for 35 days. NEXGARD kills adult fleas and is indicated for the treatment and prevention of flea infestations (Ctenocephalides felis) , and the treatment and control of American Dog tick (Dermacentor variabilis) infestations in dogs and puppies 8 weeks of age and older, weighing 4 pounds of body weight or greater, for one month. Storage Information: Store at or below 30°C (86°F) with excursions permitted up to 40°C (104°F). CAUTION: FEDERAL (USA) LAW RESTRICTS THIS DRUG TO USE BY OR ON THE ORDER OF A LICENSED VETERINARIAN. HUMAN WARNING: Not for use in humans. Keep this and all drugs out of the reach of children. In case of accidental ingestion, contact a physician immediately. FRONTLINE VET LABS™A DIVISION OF MERIAL LIMITED.